My name is Louise and I am currently studying BSc Psychology at the University of Essex. I have been offered an amazing opportunity alongside Essex Abroad to travel to the island of Kefalonia, Greece with a small amount of other university students to volunteer at the Wildlife Sense project. In order to have a chance to take part in this opportunity I need to raise a minimum of £750 which will cover the costs of the trip. Wildlife Sense are a volunteer based organisation situated in 3 different areas of Kefalonia; Argostili, Lixouri and Skala. 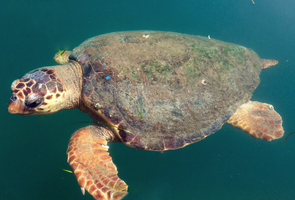 They focus on research and conservation to study and protect Kefalonia's endangered loggerhead sea turtles as well as monitoring their native coastal habitats. During my time there, we will be based at the Argostili location. Upon arrival, we will meet with volunteers of the Wildlife Sense project who will be leading us through the 2 weeks; providing our training and resources needed for our work whilst we are there. The first few days will involve a lot of information and training sessions, preparing us for the two weeks. 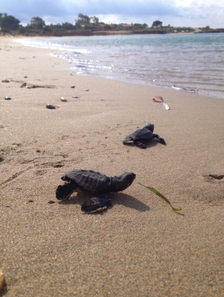 When the work begins, we will cycle to the beaches at sunrise to record fresh turtle tracks and protect any nests. 10 beaches within Argostili are under protection therefore our location for the day will vary. We shall protect the mothers, as well as ensure the young sea turtle hatchlings make their way to the sea and remain as safe as possible. 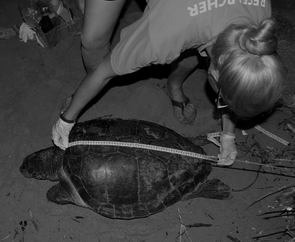 Research on the nests, tracks and eggs shall be carried out around this, looking into the scientific methodologies that are important for the successful protection of sea turtles and the collection of accurate data. Of course not every minute will be spent working, therefore at weekends, evenings and days off, the beautiful island of Kefalonia can be explored. I am taking part in this project for a number of different reasons. First of all to gain knowledge and experience from an area I wouldn't otherwise have an opportunity to do so, as well as to take part in an amazing cause and do my bit to support Wildlife Sense and the amazing work they do. In the long run, this project will benefit my own psychological studies because as part of my current degree course, I have to take part in research. Therefore to gain hands on experience in such an amazing environment will give me an immediate head start for that. The remaining £100 of the minimum £750 target will be spent on necessary kit such as clothing, boots etc. If I exceed my £750 target and reach my overall goal of £900 , I will spend the money on better quality kit as well as a camera to capture all the amazing work we carry out on the trip to share with everybody when I'm home. I can create a log of the trip to share with more students like me to inspire them to do similar things, as well as remind everybody of the amazing work organisations such as Wildlife Sense, carry out. By donating, no matter how small or how large, you yourself will be helping this great organisation progress and continue to provide the amazing support they do, as well as being able to offer many more people like me the opportunity to go out and get a hands on experience for such a great cause whilst gaining life long memories and invaluable experience. You can find interesting updates and more information at the Wildlife Sense website, as well as updates throughout the summer on my Facebook page included below to see exactly where your money has gone and the difference you have made. Finally of course you do not need to give money to help me succeed, but you can still make a huge difference by spreading the word and allowing my story to reach as many people as possible, especially those who may also be able to help.